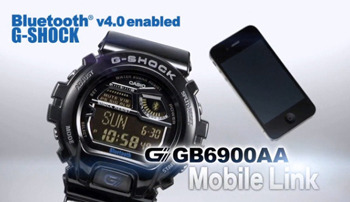 The uniqueness of G-Shock watch is that if the owner suddenly departs from the iPhone more than 10 meters, they begin to warn about it. In addition, the display shows alerts for incoming calls, messages, data on the alarm clock, appointments, etc. There is also the automatic adjustment to any time zone for synchronization with your smartphone. To run all these features, you must install the iPhone App G-Shock +. Genuine novelty presented in a sturdy steel frame. Water Resistant – 200 meters. Besides the basic functions, the model is also equipped with a timer, stopwatch, alarm clock, silent mode and display backlighting. Collected on the basis of the quartz clock mechanism. Batteries battery life when using bluetooth-connectivity 12 hours a day – up to 2 years. The new model from Casio is available in the U.S. for $ 180.